With Maine windjammer cruises, you're in for one of life's true adventures -- sailing the bounding main on one of the beauties plying Maine's spectacular coastal waters. In fact, there might not be any better way to take in the state's rugged natural beauty. 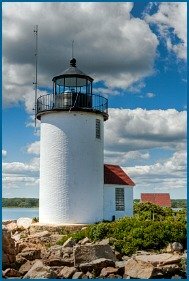 Naturally, you'll view the magnificent coastline from a unique perspective, but Maine windjammers also give you a splendid "up close and personal" view of the islands scattered throughout Maine's bays, coves and harbors, historic lighthouses, and seabirds, seals, whales and porpoises. And best of all, Maine windjammer cruises are available all up and down the coast, so you can see and experience the particular region that most tickles your fancy. According to the good people at Merriam-Webster Dictionaries, the definition of a windjammer is pretty simple: it's a large sailing ship. So depending on your point of departure, you may set sail aboard a traditional many-masted schooner, a sloop or ketch, or perhaps a converted racing yacht or oyster boat. "With no set course to follow, a windjammer sails wherever the wind and the captain's whim takes it..."
Any of them can deliver the vacation of your lifetime. Many Maine windjammer cruises allow you to try your hand at the helm, raise sail, haul line or you can just kick back and enjoy the stunning, ever-changing views and fresh air. Voyages can be as short as a couple of hours or as long as a week or more, so sailing in Maine can easily be part of your vacation -- or your entire vacation. Many (if not all) of the overnight Maine windjammer cruises include three delicious meals each day you're aboard, so you can feast on a bounty of fresh local seafood while enjoying better views than you could possibly imagine. If you don't have much time but you still want to make your nautical adventure as memorable as possible, consider taking one of the shorter sunset harbor cruises that Maine windjammers are also known for. As I mentioned, Maine windjammer cruises are available along almost the entire length of our coast: the closest windjammer cruises to York are both out of Perkins Cove in Ogunquit, Maine. 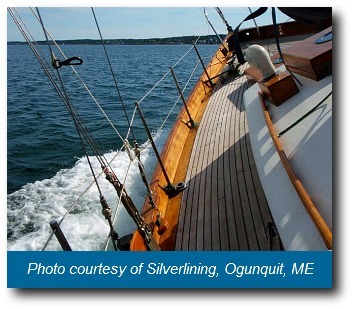 For over 25 years, Captain Jack Gordon has been taking up to six passengers to sail the coast of southern Maine aboard the Silverlining. Captain Jack's tours last either 1 1/12 or 2 hours and he's open from Memorial Day to Columbus Day in mid-October, 7 days a week, "as long as the sun is shining". Another Ogunquit option for up to six people is to set sail on the 34’ Tartan sloop The Gift, with U.S. Coast Guard Captain Steven Perkins at the helm. Also departing out of Perkins Cove, The Gift sails the coast of southern Maine for 1 1/2 hour long cruises from late May to mid-October. A bit farther up the coast, Southern Maine windjammers such as the ketch Pineapple sail regularly out of Kennebunkport, under a half hour from York. Pineapple departs from the Nonantum Resort on a daily basis (subject to weather conditions, of course) and her two-hour sailings and sunset excursions provide the perfect way to see Kennebunkport's picturesque beauty. Alternatively, you could take a memorable cruise on Eleanor, a classic schooner operated by Captain Rich Woodman. Eleanor's home port is also Kennebunkport, and she plies the waters between Cape Arundel and Cape Porpoise. Still under an hour north from York, Portland Maine serves as home port for several Maine windjammer cruises. One of the shorter sails from Portland will provide you with an unforgettable experience and still get you back in York in time to watch the sunset at Nubble Lighthouse! 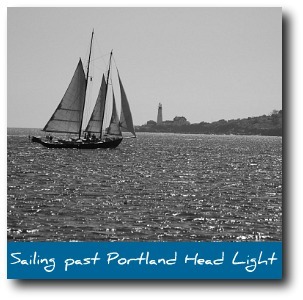 For instance, one of the graceful Maine windjammers operated by the Portland Schooner Company, including the Bagheera and Wendameen, can let you experience the pristine waters of Casco Bay and some of the state's most beautiful sights and sounds. Portland Schooner Company offers two-hour, day trips and overnight Maine windjammer cruises leaving from Portland's Maine State Pier, but a special mid-morning sailing also includes a delicious lobster bake on scenic Cow Island. Maine Sailing Adventures, out of Portland's Old Port, offers an equally unforgettable experience when you come aboard the elegantly tall Frances, a beautiful 74-foot gaff-rigged topsail sloop. In fact, her owners say that Frances is the largest engineless windjammer available for charter out of Portland, so sailings aboard Frances are sure to be an authentic, eco-friendly windjammer experience. Farther up the coast, Boothbay Harbor on the Maine Midcoast is all about boats, boats, and more boats. 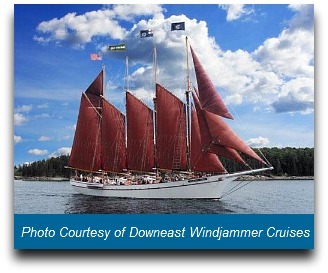 In fact, Boothbay hosts an annual late June event called "Windjammer Days". Among other things, this yearly festival features an antique boat parade. 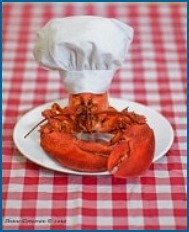 Windjammer Days is especially fun for families, with pancake breakfasts, waterfront concerts, children’s events, arts & crafts show, a street parade, the antique boat parade and fireworks exploding over Boothbay Harbor. But you don't have to just watch -- you can also go on your choice of several Maine windjammer cruises sailing out of Boothbay Harbor. Short voyages that take passengers past the area's islands, lighthouses, coves, seal colonies and lobster boats seem to be the most popular. The 65-foot schooner Eastwind, operated by Captain Herb Smith, will take you to the outer islands and Seal Rocks. Balmy Days Cruises offers short sailing excursions out of Boothbay Harbor aboard the Bay Lady, a 31-foot Friendship sloop, while Captain Joe operates the historic 48-foot schooner Lazy Jack. Glorious Penobscot Bay is probably the home of the largest fleet of windjammers in the entire country. The schooner J. & E. Riggin, sailing out of Windjammer Wharf in Rockland Maine, offers an unequalled sailing adventure along mid-coast Maine, dropping anchor in a different harbor every evening. 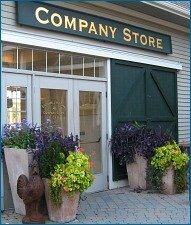 There's simply no better way to see and explore the coast between Boothbay and Bar Harbor. Operated by Captain Jon Finger and Co-Captain Anne Mahle, the ship is comfortable and clean, and the food is plentiful and delicious. Captains Doug and Linda Lee sail their 95-foot coasting schooner Heritage on week-long voyages out of Rockland, anchoring along the way at several unspoiled harbors and islands. As with all other sailing ships, the itinerary of Heritage is set by the winds and tides, but it's always packed with memories and relaxation. 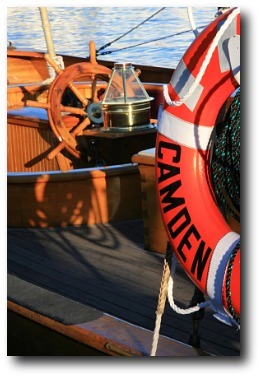 Nearby Camden Maine is home port to the Angelique, a 95-foot ketch-rigged windjammer which makes 3, 4 and 6 day cruises operated by the Yankee Packet Company. She sails between Portland and Bar Harbor, passing the numerous islands peppered throughout Penobscot Bay. The 90-foot schooner Mary Day, skippered by Jennifer Martin and Barry King, offers uncluttered decks and cabin skylights to enhance your sense of spaciousness, and every cruise features an all-you-can-eat lobster picnic. Lighthouse, nature, wine and other specialized cruises throughout Penobscot Bay are available. Never to be left out, Bar Harbor and the Acadia National Park area also offers a number of Maine windjammer cruises. For example, Downeast Windjammer Cruises offers spectacular sailings among the islands of Frenchman's Bay, aboard the truly majestic 151-foot schooner Margaret Todd. In many ways, Maine windjammer cruises are a tribute to the state's storied nautical history. But they also give you the opportunity to see Maine's magnificent coastline the way I always think it should be seen - from the deck of a windjammer, gliding almost silently through the blue Atlantic waters. Hungry? Select just the right place to eat from these Southern Maine Restaurant Reviews!